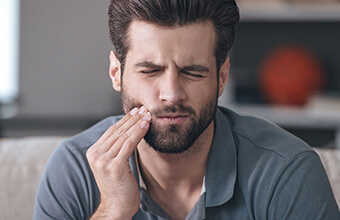 Seemingly disparate symptoms such as headaches, earaches, tenderness of the jaw joints or muscles, or dull aching facial pain may actually all come from the same place: strained and misaligned jaw joints. These problems are often referred to as TMJ (temporomandibular joint) disorders. The muscles and joints may not be functioning properly, resulting in cycles of pain and spasm. The causes of some TMJ disorders are not well understood, and because of this, there are varying opinions about diagnosis and treatment of these conditions. Fortunately, you can get both the diagnosis and treatment you need right in Houston, TX with Dr. Cher Rich. When the muscles and joints in the jaw do not work properly, this can often cause a spasm. This spasm can become part of a cycle that results in tissue damage, pain, muscle tenderness, and even more spasms. While some cases of TMJ disorder may have clear cut causes, such as trauma, arthritis, or severe stress, most are due to a combination of factors. Discs often slip forward in the joint, which can lead to problems such as clicking, popping or even getting “stuck” for a moment. However, these often are minor problems, and in the absence of jaw pain, they usually don’t require treatment. Oral habits such as clenching or grinding (bruxism) can develop as a response to stress or as part of a sleep disorder. You may not be aware of this nighttime clenching or grinding, but you may catch yourself doing it during the day. These habits can tire the muscles and cause them to go into spasm. In time, persistent muscle problems may damage the joints themselves, and a complex cycle of pain and improper function can easily begin. TMJ disorders have many signs and symptoms. Pain in or around the ear, sometimes including the face. Teeth that are extremely sensitive to cold. If you are dealing with any of the symptoms we mentioned above, we can provide treatment using a simple oral appliance called an occlusal splint. This will slightly move your jaw into a more functional position so the muscles can relax, heal, and reorient themselves. You don’t need to deal with a stiff jaw or chronic headaches anymore. Simply contact our office today and we can start getting you the relief you need.